The Great Buddha Statue tells us the story of how Shakyamuni became a Buddha, surrounded by a multi-layered, ornately decorated temple honoring the Buddha. 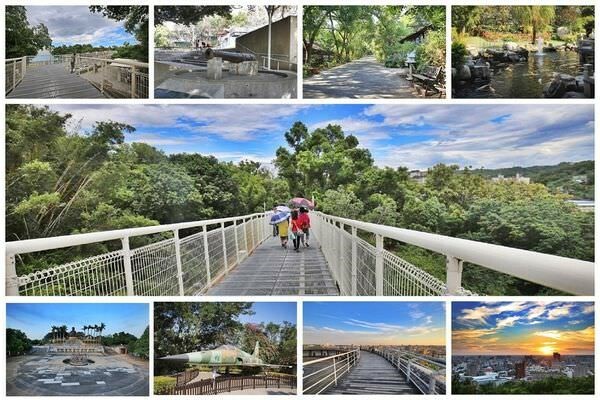 The Baguashan Skywalk allows you to overlook the ecological beauty of the canopy and it also provides one of the best panoramic views of Changhua City. You can take a walk along the literature trail, and visit Changhua Arts Museum or the Spring of Youth. You can enjoy everything along the same road – humanity, literature, and ecology. Come and enjoy Changhua. The Changhua Baguashan Skywalk was built in 2016. It resembles an iron dragon, wrapped along Bagua Mountain in Changhua. This skywalk is 1,005 meters in length and ascends up to 16 meters in height. It is the longest skywalk bridge in central Taiwan and it connects to other tourist sites in the area. Founded in 1922, the Changhua Roundhouse is located north of Changhua Station and is under the jurisdiction of the Changhua locomotive depot. The area mostly revolves around the train turntable, fanning out into twelve tracks, forming a semi-circle. Previously, roundhouses could also be found in Taipei, Hsinchu, Chiayi, Kaohsiung and Kaohsiung Harbor. However, due to railway modernization, these roadhouses did not escape the fate of being dismantled. Such fate almost fell on the Changhua Roundhouse due to plans to build a train maintenance base in the middle of Taiwan. Yet, because of the zealous efforts made by the locals and railway fans, the Changhua Roundhouse survived unscathed and the train maintenance base moved south. Therefore, Changhua Roundhouse is the only existing roundhouse in Taiwan. Lukang Old Street in Lukang includes Putou street, Yaolin street and Dayou street. Yaolin street and Putou street were business centers in old Lukang. In present day, they have been included in the ancient monument protection area. The red brick streets are pedestrian only, so you can experience the old style markets without fear of Taiwan-style drivers. They immerse themselves in the literary and historical studios and seek childhood memories in the traditional shops. The ancient buildings, the old artifacts that repel evil spirits, as well as scrolls reveal the life pace and style in the old days. As the tourism industry prospered in recent years, some home owners began to sell folk artwork, representing the new style of the old streets. While the tourists are reminiscent of the old time, there are still more places to visit. Lukang Tianhou Temple was built at the end of the Ming Dynasty and the beginning of the Qing Dynasty. The temple enshrines Goddess Mazu, which was one of several tutelary gods for people in the Minnan area in the early days. In the 3rd year of Emperor Yongzheng in the Qing Dynasty (1725), Shi-bang donated the place and relocated the Mazu Temple to its current location. The Tianhou Temple was renovated in the 13th year of Emperor Tongzhi in the Qing Dynasty (1874) and the 11th year of Emperor Showa (1936) in succession. Today’s temple includes the pattern and layout from the renovation in the 11th year of Emperor Showa. The temple was appointed as the third-class historic site in 1985 and a Mazu Folk Art Hall was established in 1992. Tianhou Temple still preserves the “Shen Zhao Hai Biao,” the horizontal inscribed board bestowed by Emperor Yongzheng and Emperor Qianlong, the “Yu Tian Tong Gong” horizontal inscribed board bestowed by Emperor Guangxu, and the horizontal inscribed boards presented by Fujian Governor Shao-Lan Wang, Lukang officers Lan-Pei Wang and Shou-Ming Sun, and Fujian Land Route Prefect Wen-Mo Xu. All are very important cultural assets to Lukang Tianhou Temple. Breast Touching Lane is the narrowest alley in Taiwan. It is 100cm wide and with less than 70cm at the narrowest point, it would not be wide enough for two people to pass. If two people insist on passing through at the same time, their chests would be in contact with each other, hence the name. The “Banbian (“Half-Side”) Well” is actually a complete well located within residence of the Wang Family on Yaolin Street. In the early days, it was not possible for every family to have the finances to dig a well of their own. The master of the household had the funds and therefore dug a well by the side of wall. One side was offered to the neighbors to use, and the other half was in their courtyard for personal use, demonstrating the traditional virtue of being a good neighbor. Located on Yuannan Road, this short trail is also known as the Butterfly Trail because of the large amount of butterflies found in the spring and summer. The diverse forests along the trails offer rich ecology and provide shade to the hikers. It is a trail with adequate length and slow slopes, suitable for family activities. The acacia and mixed woods provide shade and the resting pergolas offer great angles to the panoramic view of the Tengshan Bridge Trail and Yuanlin city center. The garden has a variety of flowers. Thousands of people visit this famous garden. When visitors enter the flower area, they will be treated to a snack, coffee, and herbal tea in the gardens. There are some education programs for adults and children, such as planting, stone engraving, and combination arts. 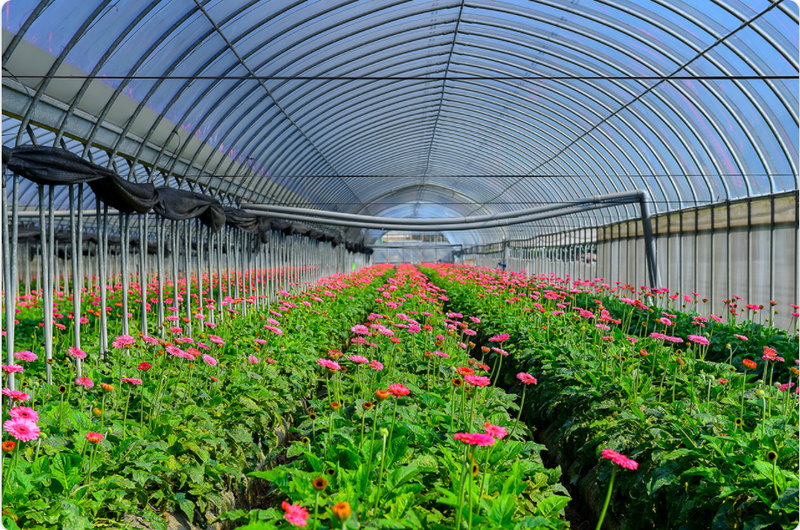 The planted flower area occupies 341 acres including the province highway area.From October to December, flower gardeners use lights to keep the plants growing. The lights are bright enough to light the whole garden, making it look like the middle of the day, even at night. You can enjoy the beautiful flowers along the 4.7 km province highway. If Penghu's Double-Heart of Stacked Stones is the heart of the vast blue ocean, then Dacun's Double-Heart Pond is the heart of the earth. Standing by the Double-Heart Pond, on top of the viewing platform, one is captivated by the beauty of the heart pond and the surrounding landscape. If your timing is perfect, you might just catch the amazing Pinghe sunset. Wanggong is a fishing port in western Taiwan. Since the organization of the Wanggong Awakening National Literature and Art Festival, a tourism and recreation fishing village have become the targets of development of the fishing port. The area contains a rich culture, wetlands ecology, and the 'lamps of fishing boats in Wanggong,' one of the eight wonders of Changhua County. Wanggong is a typical fishing village. It is famous for its oysters, rich natural landscapes, and cultural resources. The port has features like mangrove forests, water birds, fiddler crabs and mudskippers. The fishing village scenes include the Wanggong Fishing Port, lighthouse, sea-watching platform and bamboo rafts; and local industries like asparagus fields, dairy farms, and aquaculture ponds. The term “Rou Zong” means dumpling in Chinese, and “Jiao” means corner. This beach is called “dumpling corner” because the shape of the Tetrapods lining the beach look like dumplings! How creative of the Xianxi people to integrate the food we cherish into everyday life. Also, Rou Zong Jiao Beach is one of the most popular volunteer spots for people to help their community through beach cleaning events. These events take place several times throughout the year. This small tourist attraction was originally designed by a local building construction company as an art installment. In recent days, the site has been gaining popularity as more and more people come to see the very Instagram-able village of tiny homes. You can see why it has become a popular hashtag site in Taiwan! These rainbow colored houses were built so that everyone’s colorful dreams may come true! CashanLi is the former name of Hemei Township. In its earlier days, the township was known for its umbrella industry. Paying homage to this township’s industrial past, the landmarks here consist of trees and lanes decorated with colorful umbrellas. These sites tell us an ancient story of the delicate and skillful practice of fashioning hand-made umbrellas and how this skill has been passed down from generation to generation. Have you ever wondered where those wonderfully soft socks you bought in Taiwan were actually made? Have you ever went to find the tastiest guava in all of Taiwan? Look no further than Shetou Township in Changhua County! Take a trip to see the Soxlink sock factory. 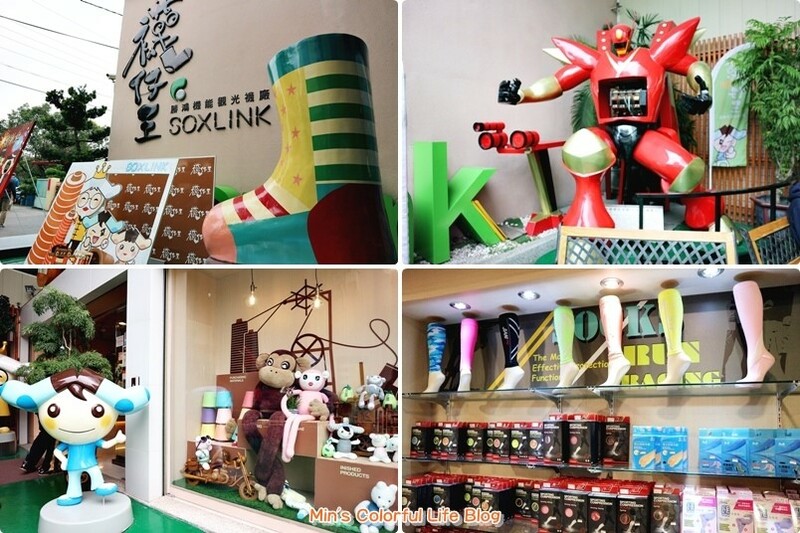 At Soxlink, not only will you see the fabric machines weaving the socks, but, you will also be able to see how the company has innovated their time-honored tradition of sock making to keep-up with large global brands like Nike, Adidas, Reebok, Target and so on. After your visit, take a pair of socks home to remember your trip! If you are a nature lover, you cannot miss the scenic hiking trail in Qingshuiyan Forest Recreation Area. There are hiking trails near Qingshuiyan Forest Area, as well as the Changqing Bikeway and countryside scenery. With several different levels of trails, people of all ages can enjoy the forest views while breathing in the fresh air and listening to the singing birds. In 2017, the Changhua County Government opened Qingshuiyan’s hot spring experience facility. Now you don’t have to travel far into the mountains to experience the wonder of Taiwan’s hot springs! Everyone is welcome to come and experience the beauty of nature. Taiwan Glass Exhibition Hall provides a free location for local glass artists to display their creations. There are several different sections representing the glass works in the hall which break the traditional stereotypes of the glass industry. Sticky Rice (米糕/油飯) is a Chinese rice dish commonly made from glutinous rice. It is cooked in many different ways according to culture and tradition like the rice dumplings commonly made for the Dragon Boat Festival . It is typically made with soy sauce, oyster sauce, scallions, cilantro, mushrooms, and pork. Savory rice pudding is another sticky rice dish also called Wa gui that is served in a bowl mixed with duck egg yolk, shiitake mushrooms, pork, and shrimp. This omelette is different than a western style omelette since it doesn’t just rely on egg to make the ‘pancake.’ It also uses a flour and water mixture and is then added to vegetables, finishing with the special spicy and sour sauce. The fried Oyster bun is a special fried seafood snack that is usually served on the Taiwan coast. It is made with a flour base, with layers of cabbage slices, sprouts, green onions and oysters. It is then deep fried in the pot until the crust is golden. Ba-wan is a Taiwanese street food, consisting of translucent dough made of sweet potato starch filled with a savory stuffing and served with a sweet and savory sauce. The stuffing varies widely across different regions in Taiwan, but it usually consists of a mixture of pork, bamboo shoots, and shiitake mushrooms. Changhua style ba-wan is considered to be the "standard" ba-wan since it is the most famous and most widely imitated of all styles. Silver needle noodle is a variety of Chinese noodles. It is short, about 5 cm long and 5 mm in diameter. It has a white semi-transparent color. The noodles may be stir-fried, scalded and flavored with a mixture of sauces, cooked in soup or cooked dry in a clay-pot. Ba-Boa shaved ice is a popular dessert in the hot summer! It contains a total of eight (ba comes from eight in Chinese) kinds of beans and sweets-- big bean, red bean, green bean, jelly, peanut, pineapple, sweet potato and little tapioca.